NES Disney's DuckTales (USA) in 08:11.38 by OmnipotentEntity. 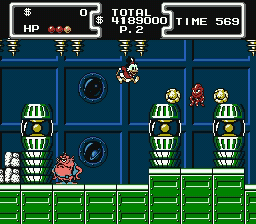 Duck Tales is a classic game in which Scrooge has to collect treasures from all over the world. Some of the levels are not completely straightforward, and collecting items is sometimes necessary before proceeding. He also has an almighty pogo stick with him that can be used in various ways, which makes jumping a lot more fun. This is the third TAS of Duck Tales at difficult level, merely 3 seconds faster than the previous version by Genisto.